We celebrated Michael's little brother's birthday this weekend at their Mom and Dad's house. Judging by the candles, he is either eight, fifty-three, or thirty-five. 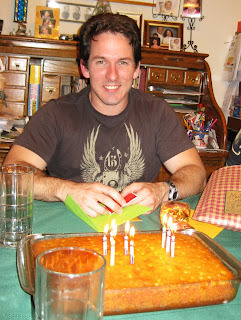 Notice it's the same lemon cake that Mike got for his birthday two weeks ago. It would appear to be a family favorite!